RHC activists and volunteers at a protest rally organized by the group in front of the White House on February 10, 2019. Protesting in front of the White House, RHC activists call for the Green Card backlog and the DALCA children’s issue to be included in ongoing border security talks. 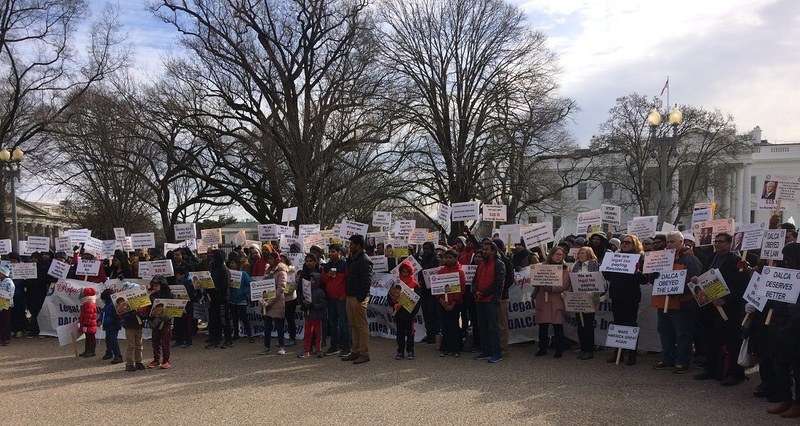 Hundreds of Indians on H-1B visas gathered in front of the White House on Sunday, calling for the elimination of a huge backlog in Green Card, affecting Indian nationals, and for the protection of children of H-1B visa holders, who lose their H4 visa status once they turn 21 years old. The immigration rally, organized by the Republican Hindu Coalition, was held in the backdrop of a contentious immigration negotiation focused on President Donald Trump’s demand for a border wall, in order to avoid another federal government shutdown. According to RHC, H-1B visa holders from as many as 34 states attended the Sunday afternoon rally. Addressing the protesters, the organization’s founder Shalabh “Shalli” Kumar said his organization wants to make sure that the current Green Card backlog for Indian nationals is reduced to between one and five years. The United States annually grants a fixed number of work-based Green Cards to citizens of various nations, regardless of the size of the country. At the moment, roughly 700,000 Indian nationals who are currently in the country on H-1B, along with their spouses and children below 21, await Green Cards. At the present rate, many of these Green Card aspirants have to wait for decades before they can become Permanent Residents. DACA, or “Deferred Action for Childhood Arrivals,” is an Obama-era immigration policy that allows children of undocumented immigrants that were brought to the United States while they were minors protection from deportation. Children of H-1B visa holders who came to this country on the dependent H4 visas need to leave the United States once they turn 21, unless they change their visa status. RHC calls such children “Deferred Legal Childhood Arrivals,” or “DALCA” children. The organization says “DALCA children” include some of the best and brightest minds, including Spelling Bee champions. Among the several hundred who were present braving the cold weather was Priya Mohan, a so-called DALCA child, who drove down to the nation’s capital, along with her mother, Subhashini, from Edison, NJ. Mohan came to the country on H4 visa, along with her parents, when she was 12. When she turned 21, she could no longer continue to remain in the country on H4 visa, as a dependent of her father. Mohan enrolled for a master’s degree and changed her status to F1 student visa to avoid leaving the United States. Now she works for a financial firm in New York City. Earlier this year, she received an H-1B visa through her employer. Subhashini Mohan said her daughter got her H-1B visa in the third attempt. “Finally she got the H-1B this year,” the elder Mohan said. The Mohan family came to the United States in 2006 from Thrissoor, Kerala, India. Subhashini said she and her husband will finally get their get their Green Card in a month or two. But their daughter, now 24, will not, since she’s over the age of 21. Also among the protesters were, Krishna Mullakari, who works as a consultant for a federal government contractor. The Aldie, VA, resident has been on H-1B since 2011. Sharma, who is on H4 visa, said Sunday’s show of strength was aimed at creating awareness about the necessity of having a “permanent fix” for the green card wait. She told the Bazaar that the Green Card backlog and the DALCA children’s issue be included in any potential deal on the border security. Sharma received her Employment Authorization Document in 2015, which means she could legally work in the United States. She said her suffering in the past has made her an activist for the cause. For some reason, these guys from India believe it’s their God-given birthright to migrate to the US and take up a job, start a business, buy homes and cars, raise families. Says who?? Since when…? I’m really sick and tired of all the “I’m entitled, I have a right to protest, and I’ll spank the govt. if I have to” kinds of arguments being bandied about by Indians who are here on temp visas. Really!! You have the nerve to protest out in the streets, and are suing the govt. that even gave you a chance to be here in the first place!! And for Chris sake, stop treating America as a JOB STORE that anyone can walk in anytime and take up a job just because they got a visa. I sincerely hope the Trump admin succeeds in cracking down on the visa abuse by India Inc. about time too. I wish Miller, Bannon et al are given infinite more leeway in fast-tracking legislation that eliminates these useless visas once and forever. THERE IS NO JOB SHORTAGE IN THIS COUNTRY!! It is a myth invented and propagated by the (leftist) media to prop by a nefarious anti-American agenda they share with their globalist chums. India has the highest unemployment rate in current gov. So h1b visa holders don’t want to go back to India and they are asking to get Green Card asap. Giving them GC is permanent loss of American job.